Pebble Beach, CA - Valley Christian Cross Country opened their season at the RLS Invitational in Pebble Beach Saturday, placing both boys and girls teams on the podium. In a unique format teams of 5 each run 1.6 miles on a technical cross country course that zig-zags through the local trails. 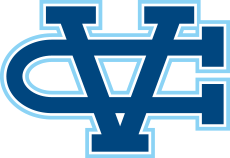 The Warriors have been attending the event for the past five years and since that inaugural run the boys have been steadily climbing the ladder in both place and team time. Since placing ninth in their first run in 2011 they have moved up every year: eighth in 2012, seventh in 2013 and fourth in 2014. 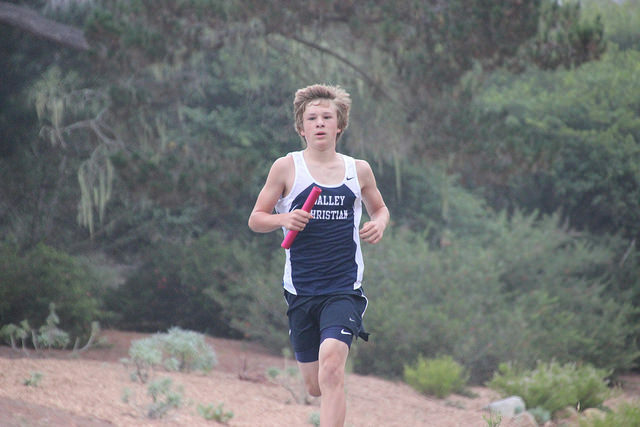 With a strong core of about 12 boys competing for the varsity spots it is no surprise that the strength of this year's team is their depth and consistency. The top 5 runners all finshed with personal bests and within 21 seconds of one another. Joe Renati was anchor and split the fastest time of the day with a mark of 8:29. That was matched by a lead off leg of 8:30 by Nedu Ndili. Justin Baraona (8:37), Mitchell Rohr (8:38) and Cameron Lockard (8:49) all ran personal bests and move into the top 10 all-time team performances. Renati, a sophomore, led the team for the third consecutive week and continues to show improvement over the longer distances. "I felt like my legs were going as fast as they could," Renati said about his race. "I feel like I could go another mile." Also making the top 20 list is Sam Cuevas (8:55) and freshman Jake DeMoss (9:15). 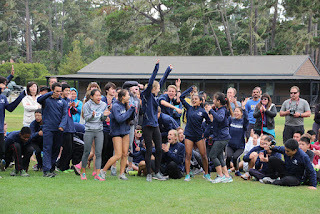 They led a strong performance from the B team that finished second in the Sub-Varsity #1 division, which was also the fastest team time ever for that division. The girls team has a long history of success at the RLS Invitational medaling each of the five years they have competed. It was a very consistent run for the Lady Warriors as there was just a 20 second spread between the top 5 runners, even less so when you consider that the first and last legs are slightly longer due to extended straightaways for the start and finish lines. The impressive depth and consistency allowed the girls team to move up the entire race ultimately finishing in the medals for a second place team finish. Freshman Mackenzie Thomas was the lead leg of the relay and ran brilliantly managing the technical 1.6 mile course in 10:43. Kailey Eddy was also solid running 10:35. 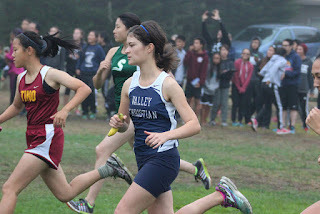 Brianna Becerra improved nearly 40 seconds over last year's time and split the fastest time of the day running 10:33. Sophia Patterson improved nearly a minute over last year (10:45) and Camille Reed continues her comeback running 10:53 to anchor the team. Just as impressive was the team's depth: Remarkably ten runners broke the 12 minute mark, more than any other year. Hannah Theaker (11:07), Maggie Theaker (11:33) both made the team's top 20 list. Kiko Li, Ashley Clayton and Sandhya Bellary were all under 12 minutes as well. The girls sub-varsity team finished second in their division and set a team record as well. "It was exciting to see our younger runners push harder than they every had and break down barriers they thought existed," Coach Hamilton said after the race. "It was a great day for the team and individual breakthroughs." Five years ago the tradition began: a brave contingent of runners hilariously used a banana for a baton… some of whom ate it after. The next year a deal was struck, if the team set a school record it would be Coach eating the banana. And so team enters each year with extra incentive to surpass the prior. "Victory never tasted so disgusting," Coach Small commented. "After being held for 7.5 miles by five different runners, the structural integrity of a banana is not ideal for human consumption." The Warriors next compete in the Chieftian Invitational at Toro Park in Salinas, CA September 19th.